In the VASIMR rocket, magnetic fields force the charged plasma out the back of the engine, producing thrust in the opposite direction. Image copyright: Ad Astra Rocket Company. 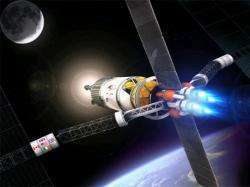 (PhysOrg.com) -- Last Wednesday, the Ad Astra Rocket Company tested what is currently the most powerful plasma rocket in the world. As the Webster, Texas, company announced, the VASIMR VX-200 engine ran at 201 kilowatts in a vacuum chamber, passing the 200-kilowatt mark for the first time. The test also marks the first time that a small-scale prototype of the company's VASIMR (Variable Specific Impulse Magnetoplasma Rocket) rocket engine has been demonstrated at full power. "It's the most powerful plasma rocket in the world right now," says Franklin Chang-Diaz, former NASA astronaut and CEO of Ad Astra. The company has signed an agreement with NASA to test a 200-kilowatt VASIMR engine on the International Space Station (ISS) in 2013. The engine could provide periodic boosts to the ISS, which gradually drops in altitude due to atmospheric drag. ISS boosts are currently provided by spacecraft with conventional thrusters, which consume about 7.5 tonnes of propellant per year. By cutting this amount down to 0.3 tonnes, Chang-Diaz estimates that VASIMR could save NASA millions of dollars per year. Chang-Diaz has been working on the development of the VASIMR concept since 1979, before founding Ad Astra in 2005 to further develop the project. The technology uses radio waves to heat gases such as hydrogen, argon, and neon, creating hot plasma. Magnetic fields force the charged plasma out the back of the engine, producing thrust in the opposite direction. Due to the high velocity that this method achieves, less fuel is required than in conventional engines. In addition, VASIMR has no physical electrodes in contact with the plasma, prolonging the engine's lifetime and enabling a higher power density than in other designs. AWESOME!!!! I hope teh development of this can be sped up! I hope NASA do put this on teh ISS and we can see teh results! How long woudl a moon journey take with this? A moon journey would only take two and a half minutes with this!!!! Awesome!!!! Sounds too good to be true, but if it is half as good it would change the currently gloomy picture of future human space travel. On a return trip from Mars, you could become a fire trail zipping through the Earth's atmosphere just 2.5 minutes after speeding past the moon. Wicked! This rocket is a plasma gas rocket, its technology is based upon exponential accelaration (it starts out slow then gets REALLY fast), therefore it would take a lot longer than 2.5 minutes to get to the moon. The real benifit is for longer distances, like to mars, but im glad to see this technology finally becoming practical and put to good use. Adding to what "aerospace" said. I wish the article would say what is the thrust and specific impulse of the rocket. Megawatts require either large solar arrays or space born reactors (see http://www.world-...f82.html for info on Soviet SNAP reactor, circa 1965). Without large thrust, this translates into very slow acceleration, without large efficiencies (specific impulse -- http://en.wikiped..._impulse ) this translates in a large mass of propellant. Chemical (H2 + 02) rockets are in the 440 s region, with 400 kN thrust, ion rockets are in the thousands but with very low thrust (in the dynes!). Or in other words, it would take 1 hour and 44 minutes to get to the moon. Maybe I'm a little slow, but I'm not understanding the get to the moon in 2.5 minutes scenario? All these people talking about minute-long moon trips have certainly failed to take acceleration into account. 2) A two minute flight to the moon would necessarily involve some radical acceleration well in excess of what the human body can tolerate, squashing your organs down to pancakes. It's an amazing idea and I hope it works out, just don't get your hopes up for day trips to the moon. yes, but can I get from Los Angeles to Pasadena in less than an hour, including acceleration and deceleration? JPL wants to know. Its simple, using these kinds of engines, the spacecrafts speed *is never constant*. Its always accelerating or deaccelerating. Traditional spacecraft run out of fuel quickly. Everything is a ballistics trajectory, where the acceleration is quite severe, many times the force of gravity. Once a moon-bound spacecraft is heading toward its destination, the velocity, quite high, is constant for 99% of the trip. Spacecraft using the plasma engine would still need the severe G traditional propellant engine to take off from a high-G mass like earth, but once bound for Alpha Proxima, a 1 G plasma engine could take over, getting to a star in under a decade easily. Just have to power that engine for 10 years to get there. I'd also consider the possibility of some kind of battery (anything that could store energy slowly over time and release it quickly). To keep propellant payload to a minimum, thrust could be initiated only when the stored energy is sufficient to accelerate the propellant at the maximum reasonable rate. Whatever the time frames and thrust/acceleration ratio calculations, this is clearly a massive improvement over existing rockets and bodes well for the further exploration of our solar system (and possibly even extra-solar probes?). Very exciting indeed! Why would you assume that Mars is so far away? Reduce that figure by two-thirds and rerun your calc's. Mars is currently 1.372 AU (astronomical units) away from Earth. You may be falsely assuming that this is fact. Enough bickering over values, let's all agree that this is a brilliant development. Dibs on the first moon mansion! I could not find out the specific impulse of this machine on the site. Great movies though. Also, how much mass will a Mars trip use? Most likely a neuclear power source needed, but how big? How does the ion drive compare, a lower thrust over a much longer period. 1G=10meters/sec/sec from synchronous orbit aprox. 275K Km. to the moon from there. velocity there is about 12.5 Km/sec. Then you turn on the drive. I doubt that you can stand it on its tail and go for it to turnaround. The moon is 1 sec. away at C. 2.5 min to the moon? So that makes the average speed to get there about .006 of C. ... about 1800Km per sec. that is a speed that takes 48 hours to reach? at 1G? I don't think so. Awesome! The VASIMIR should be used to stop asteroids headed for earth and of course mining them and exploring the solar system, and eventually the whole universe. The next step will be modifiying the VASIMIR rocket engine to enable fusion of the hydrogen fuel that gets heated to hundreds of millions of degrees. If we all dont blow each other up in a nuclear war the human race will have some very exciting times in the future. Big but not extremely big. There's talk of powering vasimir rockets in the inner solar system with sunlight from PV panels but its impractical past the orbit of Mars. First, HOORAY for Franklin and his team. Many of us have been following him for years and by golly he just might make this happen. Secondly HOORAY for the citing of a 39 day trip time to Mars. Anything quicker is just not reasonable in the real solar system. If you see someone talk about "14 days to Mars" they are simply full of crap (unless they have good old USS1701 at their disposal). Allow me to continue . . .
Third, none of the trip time estimates here are based on the way it actually works. You have to understand that everything travels in elliptical orbits. No estimate based on a straight line, or constant acceleration is even going to come close. Orbital mechanics and back-of-envelope calcs are not compatable. I studied the subject because of threads like this one. Then you apply impulse again when you get there, to match speed and position and perhaps enter orbit. Constant acceleration and then turning around and doing constant deceleration has NOTHING to do with the way it really works, period. It is possible to use constant acceleration and take a "spiraling" path, which is still based on an elliptical path, but one of constantly changing parameters. This is how low-thrust ion engines would be employed for interplanetary trips. The most energy-efficient, and slowest, conventional trip time is called a Hohmann Transfer. This method has a path which is tangent to both the starting and ending orbits. It is faster than a spiraling path. The next most energy-efficient, but quicker, method is to take a path which is tangent to one or the other of the start and finish orbits. This non-tangency gives rise to much higher impulse requirements (use the law of cosines to do the vector arithmetic). To get there faster, you take a path which is not tangent to either orbit. So you have high impulse requirements at both ends. This is called Lambert's Solution. Lambert's Solution allows you to stretch your elliptical path out so that the segment of the entire transfer orbit which you actually travel can get much shorter. To get really short trip times you need really short transfer paths, which require HUGE amounts of specific energy compared to Hohmann or single-tangent paths. These short paths in turn require really large orbits: essentially you are applying the amount of impulse needed to get to the outer solar system, and then when you get to Mars you apply huge energy again to hit the brakes. BTW you better time the whole thing so that Mars is there when you arrive or you're screwed. A 39-day trip time looks close to a straight line but it is still an elliptcal path and you are almost at 90 degrees to Mars' orbit when you get there, so hitting the brakes also needs to change your direction by almost 90 degrees. In my computer implementations of Lambert's solution, the calculations break down at 35 days. VASIMR is an acronym for Variable Specific Impulse Magnetoplasma Rocket. The breakthrough here is that it can achieve the high thrust of conventional rocket engines and also operate at astoundingly high specific impulse. This allows you to carry enough reaction mass to make fast Lambert missions possible. As far as moon trips go, I'd have to do the calcs, but just a few minutes is out of the question. I would *guess* that 6 hours would be possible. Another interesting observation is that the VASIMR technology makes it possible to get from the earth to the moon in 2.5 minutes. Incredible!!!! Where does the energy for the motor come from? The article doesn't say. I assume it uses sunlight. If the wikipedia references are correct -- and I read them correctly -- the current plan would use the high specific impulse-low thrust (100 000 s /40 N) version to spiral cargo to the moon in 6 months (sorry guys :-) and the low I-high T for "first stage" type accelerations (1000 s, 1200 N). Even 1000 s is twice as good as the shuttle engines although 1200 N limits your practical uses to after-orbit-acquisition applications. It certainly sounds too good to be true. One thing which puzzles me is why NASA is not working on such engines if they offer such benefits? What is the catch here? Clearly this new rocket engine is far too good. A NASA astronaut would not even have time to eat a burger in earth orbit before being transported to the moon! A trip to the moon in less time than it takes to eat a burger? That is insane! That must be why NASA is not working on these engines. Its just mad? Actually, a 200 KW VASIMR, powered by solar cells, would take about a month to move a mass of cargo to the Moon and than several days to return to Earth orbit according to some materials on the AdAstra website. For the 10 and 20 MW versions, they indeed will need a space-rated nuclear reactor. VASIMR won't work for planetary takeoffs and landings. It's inherently low thrust. But once you're in Earth orbit, it works great to get you anywhere that's not at the bottom of a gravity well. Incidentally, 1G of acceleration is HUGE - 0.5 AU per day per day. If you could do that accelerating 25% of the distance, coasting half, and decelerating 25% (ignoring that orbital velocity match at the end), the average 5.2 AU trip to Jupiter only takes a week at 1G, 10 days at .5G, 3 weeks at .25G, 2.5 months at 0.1G, or 7 months at 0.05G. And 0.1G might be achievable with clusters of VASIMR thrusters. Note that 0.07G will get you to Mars in 39 days with this approach (at optimum alignment). But the moon is still 3 days away at 7% of a G (with the 25/50/25 plan). It takes a while to build up to significant velocities. But you still save on fuel mass - and thus can deliver much more payload. @superhuman: NASA did fund the initial stages of development. They do not have the budget to follow thru on stuff like this, not even close. Worthy ideas transfer to the private sector. The key here is that Franklin C-D was one of NASA's star Astronauts (5 flights IIRC) and had enormous credibility from the beginning. The thing that amazes me, actually, is the sight of those guys sitting casually nearby while that beast is in operation. They obviously have a lot of confidence in the technology. The fact that it is baselined for use on NASA's precious ISS speaks volumes. What's not explained here is the physics of where this seeming free lunch is coming from. In order to speed up the particles of plasma fast enough to equal the thrust of more, slower-moving traditional-fuel particles, you need some energy to do the speeding up. What fuel is available to heat and propel the plasma, that doesn't weigh as much as the fuel just being burned in a traditional liquid or solid fuel rocket? There must be some increase in efficiency via the plasma process -- that is the crux that needs to be explained. @Keno_Dan: I'm sorry, I don't see your previous post. You ask a very good question. You have to remember that timing is everything. Getting to the other orbit is only half the battle - the planet better be there at the same time or you're screwed. You cannot just "catch up" or slow down. A round trip to Mars is typically somewhere around 900 days. Yeah, and if you orient the passengers properly you can couteract the lack of gravity....1G would be perfect, ehh? @ ooooooooooooo: No Free Lunch. VASIMR needs a LARGE power source to do its tricks. A PV array for a Mars trip would be very large, much bigger than the ISS arrays. We are basically looking at a Nuclear Reactor. why bother? it used to be better, but the more liberals they get on board the more its about control and forcing manipulating what end is desired. it really only leaves enough space for those who have no idea of physics to spout, and those who do know physics dont have enough room to explain things in simple terms. if i notice more comments disappearing down the memory hole, there will be no reason to post. i guess that when they do that, they dont realize that they stole the time of a persons life in which they took the time to write and compose and threw it away!!!!!!!!!!!!!!!!!!!! why? because the policy they are implementing would chase people away faster if it was announced openly. count me moving on to better pastures. Just thinking out loud. A very very strong magentic field in the engine "nozzle" propels the plasma. In a sense this field is "pinched" inside the nozzle, but the field itself exists both inside and outside. Suppose the "outside" return lines of the magnetic field could be extended out beyond the shell of the spacecraft. They would surround the craft returning at the nose, in a similar manner as Earth's magnetic field returns at the poles. Would this field be strong enough to serve as a force field or "shield" to protect astronauts inside the craft from incoming solar radiation, as Earth's magnetic field protects us on the ground? Good idea. Google "mini magnetospheres"
its not a bad idea other than it wont work. the principals are right... though it wont create a force field. however i see waht you are trying to do. your problem will not come from the idea of circulation and sheddnig particles... (which i think your idea can work that way). it will fail in the fact that we will gain mass from material all aruond floating around, just like the planet does. also, the bigger problem comes from small objects as they pass... without the field you would pass harmlessly by each other, with the field it swings into the ship cutting holes in it. ultimately i think that we would end up using somethig like it, but first use it to gather mass around the ship. that is attract material from space and let that mass of powdered metal cover the ship... getting more dense as it gets closet to the fields.. such a powdered thing would capture things the way sand captures bullets. when you turn the field off, the particles will stay in orbit on the trajectories that you leave them in. when time to go, you fly into the cloud, turn on the fields, and your ship is covered in iron nickle powder again. i know its not as romantic as force fields... however its a lot more doable than almost anything else i have heard. in this way, the partiles and things that the mag field would deposit would become part of the shield. note that witout air in space, such soft to hard mass is easy to have and not shed. in all the literature i have ever read, i have never heard any one say to use thi. the benifit comes later as the stuff scales. that is you get a soft cloud... that makes a buffer, then you can pick up larger material for an outer coat. larger rocks. these then up your sheilding. plenty of iron and nickle with other stuff available too. Regarding the external magnetic fields, I'm not entirely sure if it applies here, but I think the common consensus is to recycle them, since that's energy going to waste. I know I read this somewhere, but I can't remember if it was related to the VASIMR or some other propulsion system. Use this engine concept to send a fleet of robotic explorers to the nearby stars. Data from Alpha Centauri in 20 to 25 years after launch maybe? So can this new rocket travel 55.7 million kilometers in 39 days, or can it travel 399.8 million kilometers in 39 days? The distance between the Earth and Mars isn't steady. How long will the trip take for the travellers? Time dilation should be easily measurable when you travel over such distances with such speed right? Neither of those are close. The actual path will be longer. Going by memory, I'd say about 25% longer, this is a really rough estimate. Remember that you cannot use that number in Newton's equations of motion to look at other cases. It's burn-coast-burn on elliptical paths with Sol at one focus of the ellipse. The only reason this ballpark estimate is at all valid is because the 39 day trip is such a stretched-out ellipse that it looks kinda like a straight line. BTW the stretched out orbit of this transfer path has a periapse at the Sun that would turn anything we can build into plasma. Thats old news they are developing that thing for years. Nasa and Ad Astra signed a agreement in 2004-2005 to develop a new propulsion systeem for deep space missions. Now they are close to a successful product and i hope in 2012-13 its operational! In the jpeg they have four connected. At current that would be 800 KW of thrust. Now connect an array of 40 and you almost have 10MW. If they boost from 200KW to 500KW you only need 20 in a row. That is doable and maybe even preferable. I'd rather be in a spaceship with 20 trusters than with one. Actually I'd rather be on earth. They are in Costa Rica. @spacester, I just wanted to thank you for your explanations of how to get from A to B in space. I was always a flop at math but this makes me want to take up the subject at my advanced age. For your next trick, are you able to explain how one would aim to rendezvous with Alpha Centauri? The biggest catch here is to get nuclear reactors into space. And that's real reactors, not nuclear batteries (RTG) because they don't provide enough power. I don't mind lifting a nuclear reactor into space, but the greenies and many politicians will strongly oppose this. If you used the 100KW version of VASIMR you could probably get there in about 39 seconds, not 39 days. @snoozan, Hey thanks, it is very much my pleasure. I literally learned the subject just so I could steer threads like this towards reality. I like the way you describe how it is difficult for us to fully grasp the way planets and everything else in the solar system is in constant elliptical motion. I have to disappoint you on the Alpha Centauri mission. The brutal fact is that with current or foreseeable technology, VASIMR included, it simply is not feasible. There is only one way I know of that is feasible, and that is "generation ships" with people spending their entire lives, or least most of them, on the journey. This in turn means that we need to know how to make babies in space and we haven't even begun to figure that out. I cannot say that I have any insight on the math involved to plot the trajectory. If only Science Fiction could be made real . . .
20% of lightspeed should be possible with theoretically valid fusion engine design. So that might bring you to Alpha Centauri in 30 years, still a long time though. @cybrbeast: NICE! Thanks for the the link to the fusion rocket, thanks for the reminder on Daedelus (I couldn't remember the name) and thanks for the link to that cool site. Those numbers look reasonable, too. Assuming a 10MW VASIMR, one could reach the centuri system in about 39 days. But seriously... I don't understand how you could even conceive sending a manned ship to the Centauri system. Wormhole transportation would be much easier.